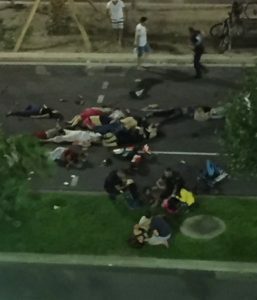 Last night, a Muslim jihadi drove a truck into a crowd at the Bastille Day celebrations (July 14th) in Nice, France killing nearly 80 people and wounding scores of others. Where would a Muslim come to believe that such behavior is acceptable in Islam? The Muslim who attacks a New York police officer with an axe. The Muslim who enters a diner in Columbus, Ohio with a machete and begins hacking people. The Muslim in Philadelphia, Pennsylvania who shoots a police officer at point blank range. This behavior is being taught by Muslim Imams in prominent U.S. Islamic schools and mosques. The attack in Paris using a truck to run people over is not the first time Muslims have used vehicles to conduct jihad. On March 3, 2006, Taheri Azar, a 22 year old Muslim of Iranian decent, plowed his SUV into a crowd of students at the University of North Carolina to “avenge the deaths or murders of Muslims around the world.” He was heard shouting “Allah u Akbar” while driving over the students. UNC refused to call this an act of “terrorism” which drew protests from students and others. On August 29, 2006, Omeed Aziz Popal, a 29 year old Muslim of Pakistani decent, drove over and injured 14 people in the San Francisco area of California, and killed one man in Freemont, CA. Witnesses said he was “emotionless” and shouted “Allah u Akbar”. This was never considered an act of “terrorism” and his family, of course, said he had mental disorders. On December 20, 2015, Lakeisha Holloway, a 24 year old black female convert to Islam, intentionally drove her vehicle over a crowd of people in Las Vegas, Nevada killing one and injuring nearly 40 others. Witnesses say she was heard screaming “Allah u Akbar.” The police said this was not “terrorism” and the woman was mentally ill.
Americans can expect a greater frequency of jihadi attacks and significantly more well-coordinated jihadi attacks in populated areas in the coming months. Muslims are becoming emboldened to do what they are instructed to do by the weakness and lack of preparedness by our law enforcement and security forces. UTT specifically trains law enforcement in identifying and investigating jihadis and jihadi organizations supporting them at the local level. For more information about bringing this training to your hometown, please contact us at info@understandingthethreat.com. Sarcasm aside, actually, the better question is why does this surprise anyone who has paid even a modicum of attention (these last few years, especially)? And on that note, JG, stay safe! Though early reports of an accelerating motor vehicle being used as a “ram-raid device” [i.e.,idiomatically, an “implement of crime”] occurred in the 30’s, widespread awareness & use of said tactical term were consequent of news reports which ensued in the 80’s. Contextually, however, as UTT’s foregoing narrative clearly implies, it would be hard to imagine an M.O. (“method of operation”) which could so readily accommodate a credible denial of criminal intent with respect to multiple homicides, than one involving a “tragic inner-city crosswalk collision” with texting and/or cell-phone conversant pedestrians (or e.g., kindergartners being shepherded “safely” across) though which, in actual fact, could be easily planned & committed by a lone-wolf jihadist at any controlled intersection (one with traffic lights) he chooses to use.